Merel, an 18 month old labrador, is helping to relieve the fears of children and teens testifying in court, either as witnesses or victims . The first of her kind in Ontario, Canada, Merel is a service dog with the Child Witness Program. Meanwhile, Pella, a labrador/golden retriever mix, is at work for the District Attorney’s Office in Arapaho County, CO . Like Merel, Pella soothes the fears of children too traumatized by what they have seen or experienced to talk. Pella, also, provides comfort to children in the courtroom. She is, however, trained to stay out of sight beneath the witness stand. Jurors remain unaware of Pella’s presence, so that it does not influence or distract them. Altogether, Pella has been involved in 450 cases. It is tragic there should be so many cases in the world in which children were traumatized, let alone in a single state. But it is clear man’s best friend has found another way to be of service. “Ask the animals, and they will teach you…For the life of every living thing is in His [God’s] hand, and the breath of every human being” (Job 12: 7 and 10). 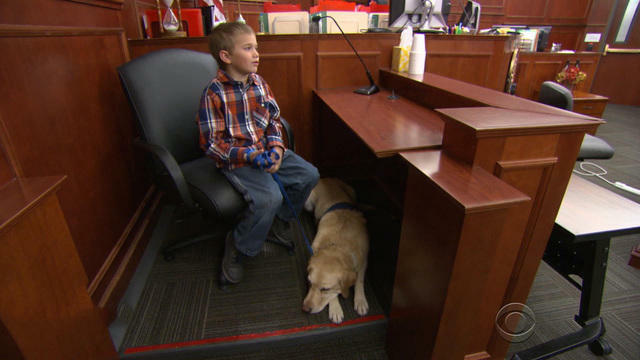 ABC News, “Service Dog Helps Kids Testify in Ontario Court” by Joie Marie McKenzie, 11/4/16, http://abcnews.go.com/Lifestyle/service-dog-kids-testify-ontario-court/story?id=43301875. CBS News, “Meet the dog who comforts children who testify in court”, 1/5/17, http://www.cbsnews.com/news/pella-colorado-courthouse-dog-for-traumatized-children-testifying-in-court/. Thanks, Alan. As you say, dogs are wonderful creatures. Those serving w/ our Armed Forces, also, come to mind. This is wonderful.These therapy dogs are so important! These service dogs are so amazing… but it is so horrific that so many children are traumatized like this. Thanks for all that you do to help these victims! Thank you for all you do, Secret Angel. I long for a time when our efforts will be unnecessary. Thank you and I totally agree with you. I visualize you with a halo and pretty wings–we all have feet of clay, who are still walking earth, and my halo is constantly in need of polish…and it’s a bit bent on one side! 🙂 Love and blessings to you this week ❤ PS–I've received the first of the pre-approval letters…one more step on the journey north!!! Oh good, we all need to laugh!! Yes indeed, it’s fabulous news–and God has been dumping truckloads of blessings on me, practically each day! I decided to order new furniture for the first time in my life–Amazon is delivering this week, I’m WAY Excited!!! And God keeps sending more angels to assist with every need–I’m overwhelmed by His great Love and faithfulness…and Favor–so full of JOY!! Many people denigrate animals when they say something like, a person ‘acted like an animal’ when they try to describe someone’s bad behaviour. They couldn’t be more wrong. In God’s kingdom, animals nearly always ‘teach’ us how to treat others lovingly and with respect. They teach us to be faithful too. Have you seen the film ‘Hachi – a dog’s tale’, starring Richard Gere, Anna? This illustrates my point. We as human beings could learn a thing or two from the animal kingdom. This is wonderful, so glad these amazing dogs are able to help children. Dogs are amazing! I love hearing how they help in so many different ways. Our Dad uses so many of the lesser aspects of His Creation to attempt to arrest our attention away from our own agendas. His love is found all around us… how often I continue to miss this in my own attempts to “find Him.” The irony of my own misguided striving. I am glad you liked the post, David. I really believe that about beauty being all around us. Human beings have managed, through selfishness and sin, to inject tremendous ugliness into the world. When we are in pain, it can be difficult to see past that. But God (and the beauty which is a reflection of Him) is there, despite that. Be well. I whole-heartedley agree. So well articulated, Anna. Thanks. I saw this story on the news the other day. It’s amazing how things have changed in this world! If this dog can help in tense situations to get to a truth, then more power to it! This is such a great idea to put off pressures to kids under stressful situations such as the boy in Ontario, Canada. A sweet post which reminds us how trustful and faithful animals can be. You always hear one side of dogs and children an trauma. The opposite way is also fact: being traumatized as a child by dogs. Whether this is provoked by adults or in another way way this is a trauma that is hard to overcome and where is even no place on earth to talk about it. as dogs are only regarded as the good, the helpful and man’s friend. It hurts to read about dogs that would help with trauma, when dogs caused so sever wounds in childhood. Thank you for your nice, understanding comment in this.